You might have also seen a viral video of the assassination of the Russian ambassador to Turkey that quickly spread through the Internet worldwide. 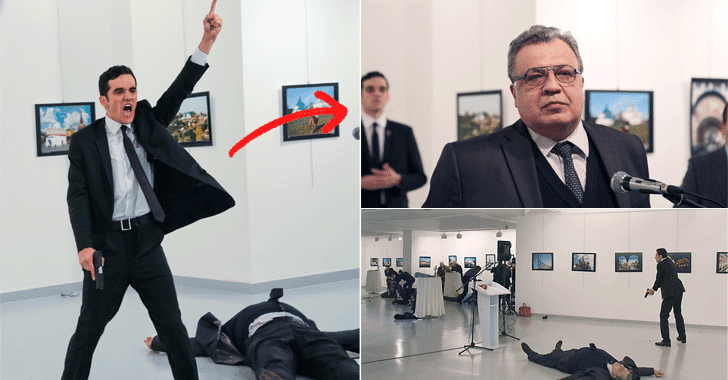 Russian Ambassador Andrei Karlov was shot dead by an off-duty police officer in Ankara on December 19 when the ambassador was giving a speech at an art gallery. The shooter managed to pretend himself as his official bodyguard and later shot to death by Turkish special forces. After this shocking incident, Apple has been asked to help unlock an iPhone 4S recovered from the shooter, which could again spark up battle similar to the one between Apple and the FBI earlier this year. Turkish and Russian authorities have asked Apple to help them bypass the PIN code on an iPhone 4S, which, the authorities believe, could assist them to investigate killer's links to various terrorist organizations. Apple is expected to refuse the request, but according to MacReports and other local media, the Russian government is reportedly sending a team of experts to Turkey to help authorities unlock the iPhone. In Apple vs. FBI case, Apple declined to help the FBI unlock an iPhone belonging to the San Bernardino shooter Syed Rizwan Farook, saying that any backdoor it developed would eventually end up falling into the wrong hands. The FBI reportedly got outside help to unlock the iPhone, for which the agency paid almost $1.3 Million to a group of hackers to unlock that device but found nothing that could help them in the investigation. The man who killed the Russian ambassador on Monday was later identified as 22-year-old Mevlut Mert Altıntas, an off-duty police officer who used his police ID to gain access to the Ankara art gallery where Karlov was giving a speech. During the assassination, the shooter shouted "Don't forget Aleppo," and according to both Russian and Turkish authorities, the assassination was designed to destabilize the relationship between the two countries.